Nestled in the hills of Tuscany in an historic olive oil mill stands La Chiusa, a delightful 18 room boutique hotel and restaurant. Originally an olive oil mill, each of La Chiusa’s eighteen rooms offer you a place to rest and relax after a day of exploring Tuscany. Every room is unique and has all the comforts of a luxury hotel. 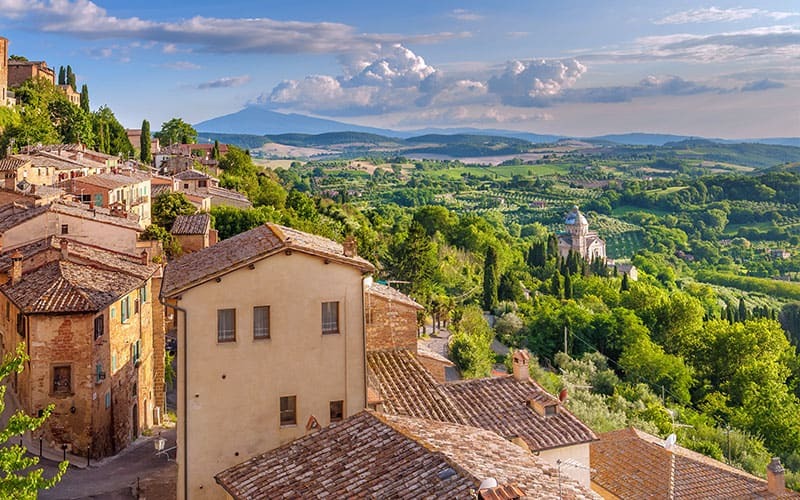 Enjoy the beautiful views of Montepulciano and Monte Amiata as you stroll the rolling hills that lead to our 900-tree olive grove. Return to your room each evening to turn down service and a sweet treat! Let our chefs delight you with a buffet breakfast full of freshly made items, for lunch try a fresh packed picnic or dine on our terrace, for dinner try our fresh made pastas, baked zucchini flowers, bread soup or perfectly prepared meats from our brick oven. And don’t forget to join us in the kitchen during your day for a slice of fresh baked cake or a piece of cantucci. We use fresh, locally sourced ingredients, and prepare each meal with recipes passed down from generation to generation. Our cooking school in Tuscany is like no other. We go to the real source of the cooking traditions. Our classes are taught by local Tuscan women; the mothers, grandmothers, aunts, and wives who know what real traditional Tuscan cooking is all about. We invite you to join us in our medieval hill-top village for a week of cooking and delicious meals where the women of the village are masters of traditional rustic Italian cooking. It is their art. They will endear you with their skills and laughter in the kitchen. Our teachers use the same recipes their grandmothers, or “Nonnas,” as we say in Italy, used. This is a unique experience; nothing has changed for generations, this is the way women in Tuscany have cooked for hundreds of years. It is truly magical to see Tuscan women cook! 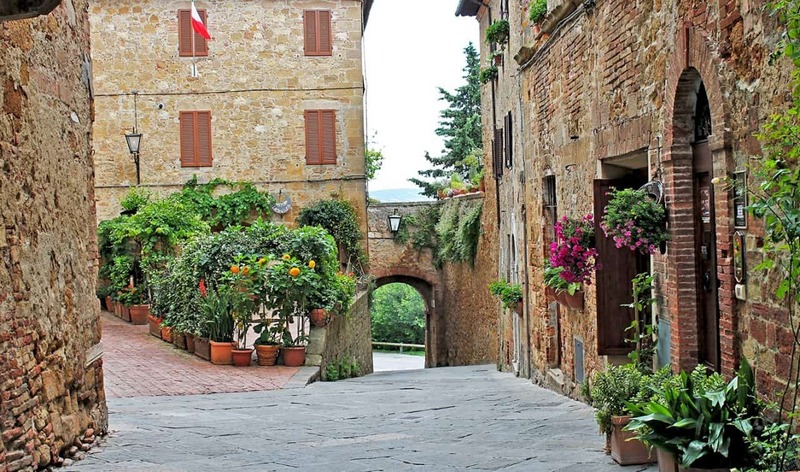 With so much to do in Tuscany, we want to share some of our favorite places to visit. We are within an hour’s drive of many fabulous and famous destinations. The perfect place to stay as you explore the region. Click an image below for more information. Montefollonico is a typical Tuscan hill-top town which enjoys a stunning view on Montepulciano, Monticchiello and Pienza. 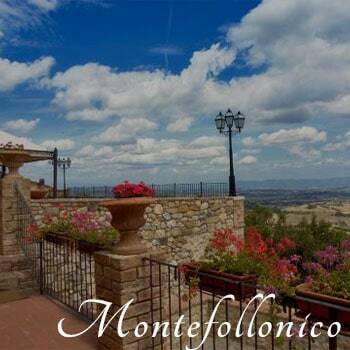 Montefollonico was a Medieval hamlet which marked out the Siennese Republic border. Cut off from the big arterial streets it has kept intact his structure and its timeless atmosphere after centuries. Today, the landscape all around Montefollonico is the same painted on the canvases during the Tuscan Renaissance age. Montefollonico, therefore, not only is the perfect place to start a visit in one of the most beautiful land all over the world, but it is also the right base for a dive into the past to rediscover the lost time. 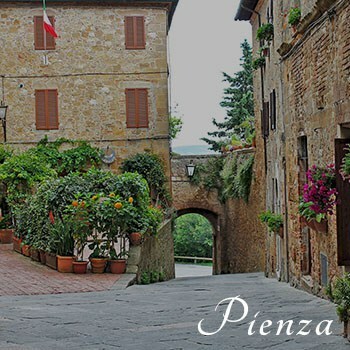 Pienza is a Renaissance gem which faces the Val d’Orcia. In 1996 it was declared a UNESCO Human Heritage site. It was completely restored by the Pope Pius II and it has a beautiful Cathedral which has a mix of styles: Gothic-French, German and Italian Renaissance. 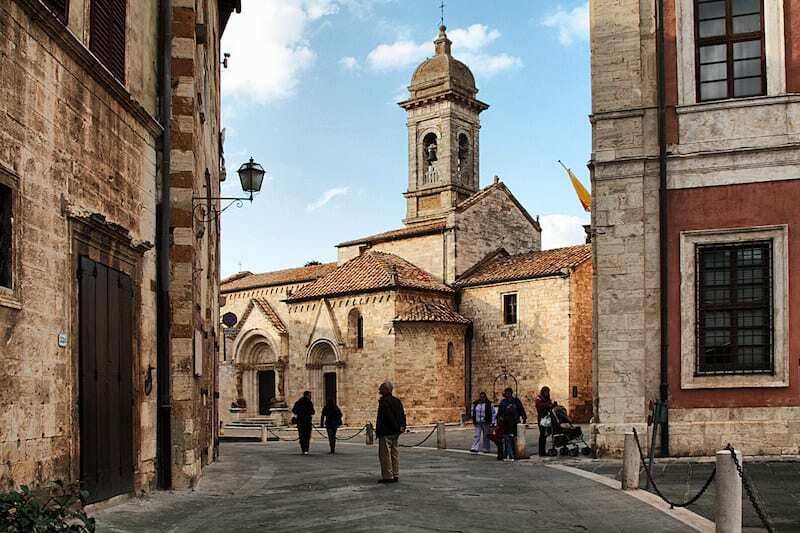 Pienza is surely the ideal place for a short journey between culture and gastronomy. It is also very famous for the Pecorino cheese which is one of the best of Italy. This place worth absolutely a visit. 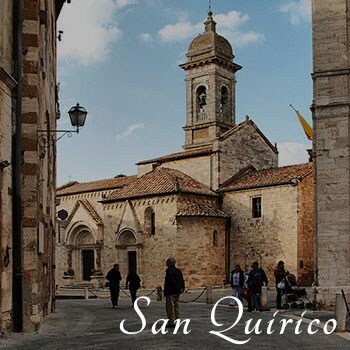 The town itself and the surroundings offer suggestive and unexpected surprises and it is, without any doubt , one of the Val d’Orcia most charming place, rich of history, monuments and breathtaking atmosphere. It still has a selected tourism and a pleasant friendliness and simplicity which finds its way into everybody’s heart. 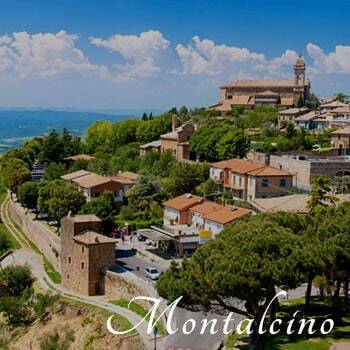 Montalcino is well known for its endless vineyards and the production of the famous Brunello wine. 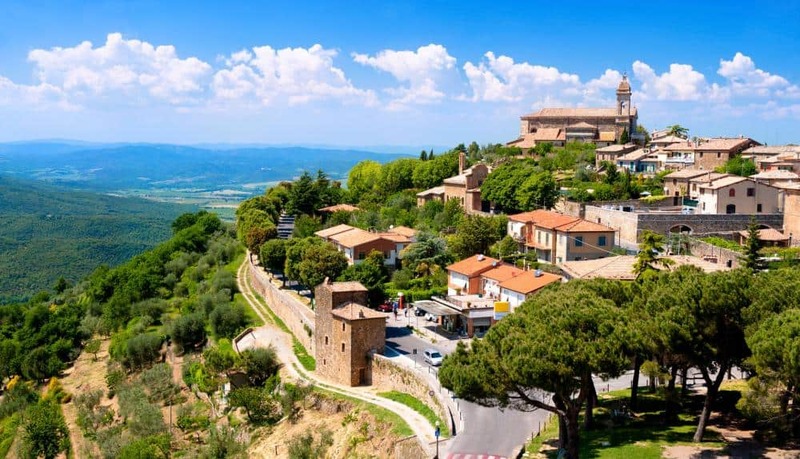 It is located at the end of the Val d’Orcia and has a beautiful Medieval Castle where, every summer, there is an archery competition with period costumes. 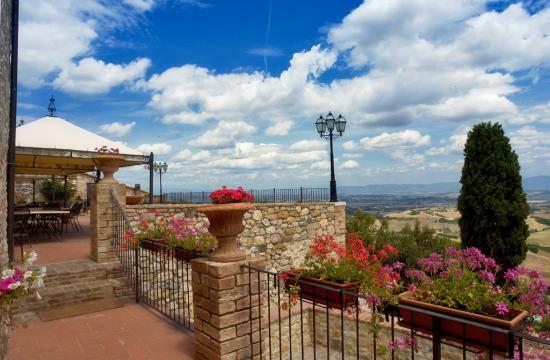 It enjoys a beautiful view on the Ombrone valley. Its famous wine is by now booked 5 years in advance, at the harvest time. 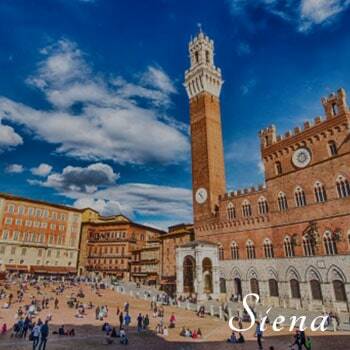 Siena’s thriving historic center, with redbrick lanes cascading every which way, offers Italy’s best medieval city experience. Most people do Siena as a day trip, but it’s best experienced at twilight. 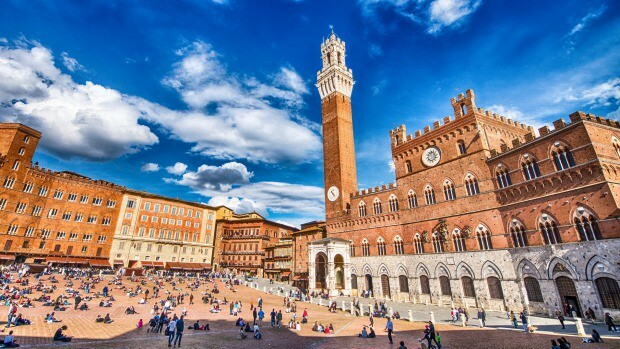 While Florence has the blockbuster museums, Siena has an easy-to-enjoy soul: courtyards sport flower-decked wells, alleys dead-end at rooftop views, and the sky is a rich blue dome. For those who dream of a Fiat-free Italy, pedestrian rule in the old center of Siena. Wander narrow streets lined with colorful flag and iron rings to tether horses. Sit at a café on the main square and enjoy the view of the buildings bricks changing color every ten minutes when sunset. 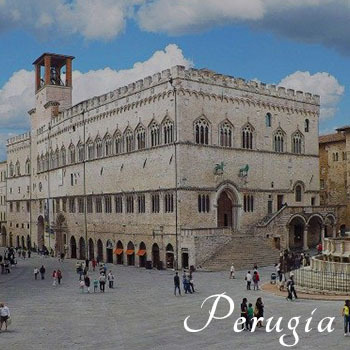 Perugia is a place of some style, at least in its old center, and a city proud of its attractions, its universities and its sights. A drink on the Corso Vannucci , its great central street, reveals a buzz you won’t find elsewhere in the region, a sense of dynamism embodied by the cosmopolitan Università Italiana per Stranieri, the country’s largest language school. This same dynamism remains evident in the city’s above-average number of films, concerts and miscellaneous cultural events and is highlighted further at Umbria Jazz (held in July), Italy’s foremost jazz festival, whose stars have included Miles Davies, Stan Getz, Wynton Maralis and Gil Evans. 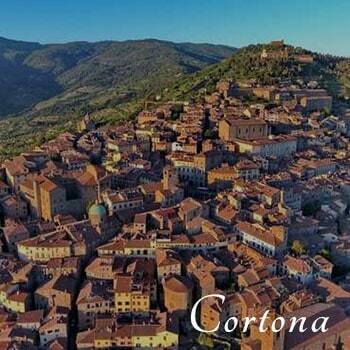 Cortona blankets a 1,700-foot hill surrounded by dramatic Tuscan and Umbrian views. 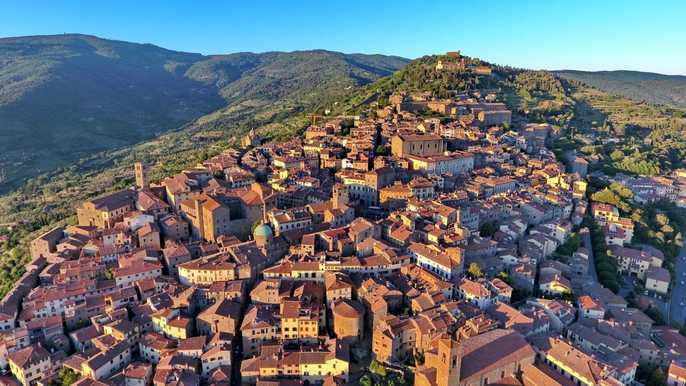 Frances Mayes’ book, such as “Under the Tuscan sun”, placed this town in the touristic limelight but long before Mayes ever published a book , Cortona was very popular and considered one of the classic Tuscan hill towns. The city began as one of the largest Etruscan settlements, the remains of which can be seen at the base of the city walls, as well as in the nearby tombs. 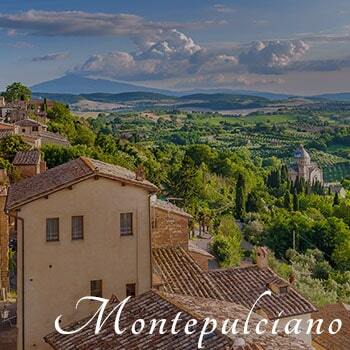 Montepulciano is the right place for a walk through the culture, history and gastronomy. 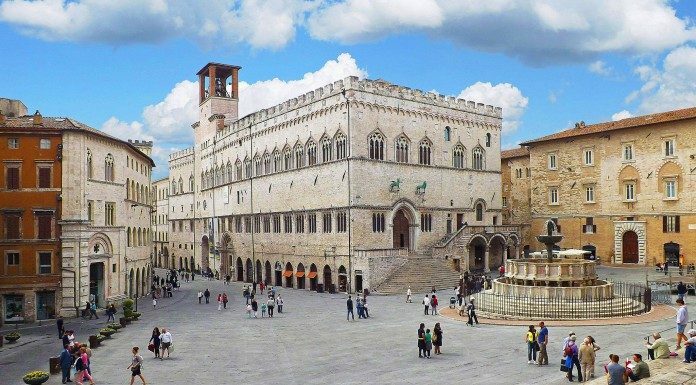 Its historical buildings, old tasteful cellars, Medieval Churches, Renaissance architecture and of course the famous Vino Nobile di Montepulciano, makes it one of the most suggestive place of the area. Outside the town wall, just at the feet of Montepulciano, set between vineyards and cypresses lies the marvelous Tempio della Madonna di San Biagio, an incredible architectural masterpiece made by Sangallo il Vecchio.